A clean HVAC system can make a world of difference both at work and at home when taking into consideration the benefits of air quality towards work efficiency as well as the health of your loved ones. 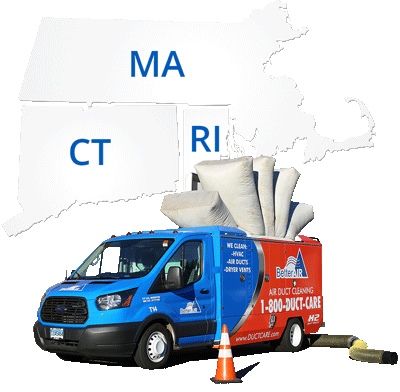 We at Better Air duct cleaning in Massachusetts, are dedicated to having you breathe easy by providing professional, efficient, and 24/7 hours air vents and ducts cleaning services. With over a decade of experience, we pride ourselves in having seasoned, certified, and the best-equipped experts who guarantee that we not only meet National Air Duct Cleaners Association (NADCA) regularly expectation but also surpassing our client’s anticipations throughout our undertakings. We understand that any HVAC system consists of more than just the Air conditioning unit at the back of your home or the large vented apparatus on top of an office building. Our services are best suited to the cleaning of all the air passages that run through the building. Equipped with high-tech equipment such as a customer made high-powered vacuum as well as a flexible tactical high-definition camera our services are world class. Why Air Duct Cleaning For Your Sturbridge Business or Home? When choosing the best HVAC system cleaning company, it is always recommended that you employ the assistance of a knowledgeable consumer service driven partner. Better Air has grown to be the most reputable HVAC cleaning professionals in Massachusetts. Firstly, our highly certified and specially trained personnel are dedicated to serving all client needs. For instance, before any cleaning is done, the work site is inspected to reduce any inconveniences during the sterilization process. Additionally, all areas that may be affected by dust or runoff debris are covered in order to preserve cleanliness. As a standard practice, we take before and after images in order to provide proof of a job well done at the end of work. In order to improve workforce efficiency, it is significant that a business provides the best possible working environment. A dusty, stuffy, or smelly workplace is guaranteed to negatively affect productivity. We at Better Air understand the demands of cleaning a buildings HVAC system starting from the AC units to the main supply branches, trunk lines or junctions, return pipes, as well as filters. Our skilled experts are well equipped with high-powered vacuum cleaners as well as remotely operate scrubs that allow the cleaning of hard to reach areas. The health of your loved ones is a top priority. Contaminants such as pet hairs and droppings, dust and pollen blown through open windows, as well as molds are often found within the home environment. All these contaminants are directly related to airborne diseases and allergies. Regular cleaning of home ducts and vents is significant in making sure your loved ones are safe and enjoy their time at home. We at Better air have years of experience in residential HVAC system cleaning thus guaranteeing the best possible service. For instance, prior to any air cleaning service, our staff conduct a site survey, highlight the most contaminated regions, and offer additional protective cover for furniture as well as other household appliances. We understand that your home is your fortress and our work guarantees a disease-free air quality supply. 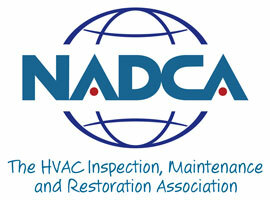 Better Air complies to the latest NADCA 2013 Assessment Cleaning & Restoration (ACR) Standards. NADCA Certified Air Systems Cleaning Specialist (ASCS) on staff to answer all of your question or concerns. Better Air is proud to be an accredited business with the Better Business Bureau® (BBB). Copyright © 2018 Better Air, LLC.